Then after this action-packed itinerary, we are returning to the Los Angeles area for the wedding and the flight home. Here’s the visual version. I would love to hear from people who have been to these places – what are the best things to do, and what is worth skipping? Museums, restaurants, scenic viewpoints, places in the parks to see? Thanks everybody for your suggestions! A long day at an out of town training on health care reform means that I haven’t had time to post. 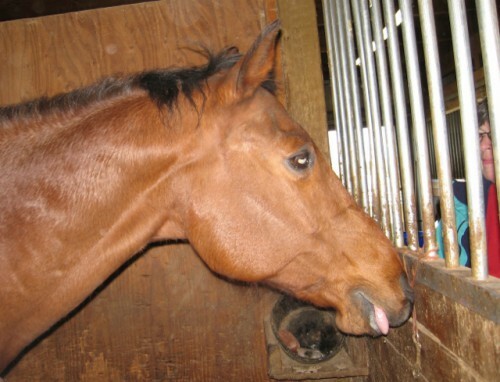 So here’s a cute photo of my horse eating an apple. He’s pretty cute, if I do say so myself! 26 years old and still going strong! Back in January, my sister in law organized a craft weekend at a retreat center near her house. I’m not particularly crafty, but my mom really wanted to go and she didn’t want to make the long trip down to Portland by herself. So, I organized all of my craft projects and made the trip. The retreat center brought back memories of summer camp. I never actually went to a regular summer camp, but I saw some in the movies. You know the kinds with row upon row of bunk beds. Yep, that was this place. There weren’t that many people there though, so mom and I had a whole room of bunk beds to ourselves. 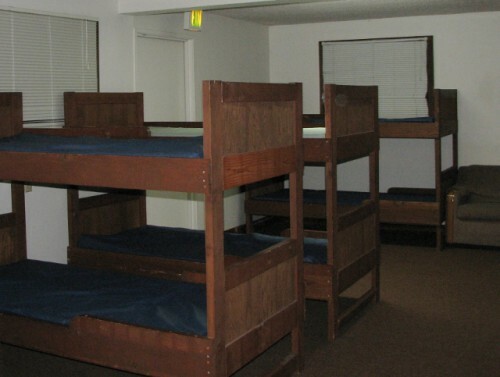 Our sleeping quarters – they did remind me that I have gotten too old for bunk beds. My Tempurpedic is much better! Since I don’t scrapbook, I brought a latch hook rug that had been half finished since I was about 19. I endured endless ribbing at work about the fact that I have a latch hook rug – in fact, one coworker was in tears because she was laughing so hard at my expense. I did manage to finish off that rug – a finished project! I also brought several felted animals. Readers of this blog know that I hosted a felting party last year where I made a felted owl. Piddles, as he came to be called, has traveled the Western United States with us since then and has been featured in some of my blog pictures. And everybody knows that one needs friends. So I wanted to give Piddles some buddies. 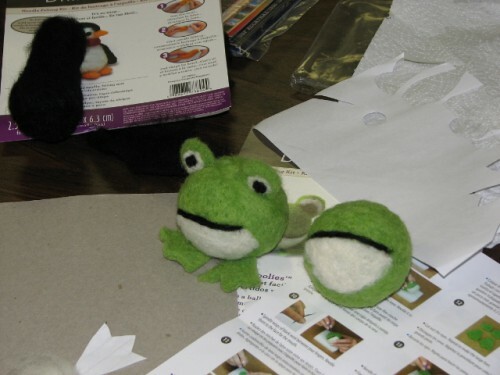 Over the course of the weekend, I finished off two felted goldfish and two felted frogs. Piddles is now part of a menagerie! I have no idea what Jon will say if any or all of them join us on our next trip! I came out of my office this morning to get a cup of tea, and found several of my coworkers gathered around the counter in the kitchen area with an egg. A raw egg – because it has to be raw. When they saw the puzzled look on my face, one of them quickly explained that since today is the spring equinox, the stars and planets align just right so that it makes it possible to balance an egg on its end. According to these elusive egg balancers, the egg must be balanced right at the time of the spring equinox; which occurred at 9:45 am PST this year. Egg balancing proceeded in earnest at 9:44 am. We HR people like to start things on time, so we were ready. Renée was doing the honors, and we all watched intently as the egg rolled over time and time again. We wondered if maybe egg balancing was simply an impossible feat. Then KayCee emerged from her office and announced that she was an expert egg balancer. She balanced the egg on her second try. At 9:45 am. The rest of us were impressed – we cheered! A visiting employee announced that he thought our department was way more fun than his own. Cell phone photos were taken. Happy First Day of Spring! 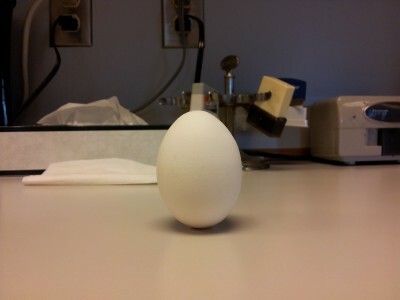 Did you know that you could balance an egg on any old day of the year? Have you ever tried? 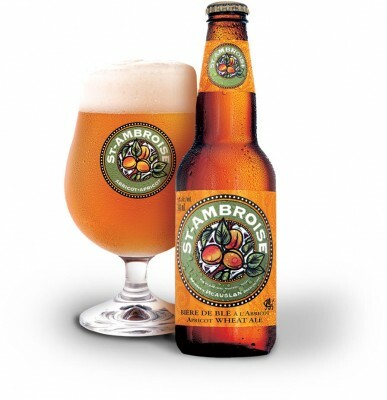 The same afternoon that we picked up the Kitten Mittons beer, I also selected a 341 ml bottle of St-Ambroise Apricot Wheat Ale, from McAuslan Brewing in Montreal, Quebec. It has been a fair number of years since I have had any Canadian beers, and back then, my taste in beer was less refined. So, I wasn’t sure what to expect, but the idea of a fruit wheat beer was intriguing. I drank it the other night, after a long day at work. On the nose, it smells of apricot. And I don’t just mean it smelled like a nondescript stone fruit, where it could have been peach, nectarine, or even something else, but this was distinctly apricot. It has very little carbonation or head (some of this was because I drank it from the bottle), but I even wondered if it had gone flat. I certainly didn’t see anything near the head that it pictured below (from McAuslan’s website). On the palate it tastes like a wheat beer with an over-layering of apricot, almost like there was apricot juice poured right in. It wasn’t too sweet though – it still definitely tasted like beer. It didn’t blow me away, but it was good – it would be a good beer for a hot, summer night on the deck. Too bad that it is still several months before it will be hot enough for that. 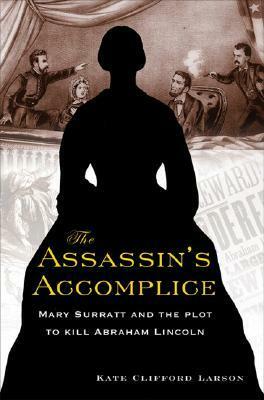 My most recent audiobook read was The Assassin’s Accomplice: Mary Surratt and the Plot to Kill Abraham Lincoln, by Kate Clifford Larson. Published in 2008, it is a comprehensive study of the role Mary Surratt played in the plot to kill President Lincoln. Larson begins her story with her belief that Mary Surratt was innocent of the charges that she was tried, convicted and hanged for. It is a fair assessment; there certainly are plenty of people who believe that Mary was caught up in the public fervor to swiftly find and punish the guilty parties. But then, she begins presenting the research, and the evidence stacks up. Larson methodically presents the case, beginning months prior to the assassination, going over Mary’s role and what she knew, and how her actions convinced investigators of what she knew. She interweaves the story of Mary’s family life, abusive marriage and eventual life as a widow trying to clear her alcoholic husband’s debts after his unexpected death. It has the rhythm of a novel, so you are never bored with the numerous records that she introduces and the facts she describes. She describes Mary in vivid detail for the reader, so you really end up feeling like you know her as a person. She describes the arrest, the subsequent investigation and interrogations, and the trial of the conspirators before the military tribunal. She doesn’t glorify either side, pointing out the flaws in both the prosecution’s and defense’s case, and explaining the part that media and public opinion played in the trial. She detailed the fragile emotional state of both Mary and her daughter Anna, and how it influenced observers both in her favor and against. She matter of factly describes the shortcomings of Mary’s inexperienced attorneys, and how Mary’s own unwillingness to provide any sort of alternate explanation against the mountain of evidence was critical in sealing her fate. And of course, one cannot ignore that fact that Mary basically took the fall for her son John Surratt, who undoubtedly had significant knowledge of the plot, but remained hidden after Mary was arrested, tried and executed. Would the outcome have been different had John come forward to stand before the tribunal? We will never know. Larson also describes the execution, making the reader feel that they understood what happened, without making it into a gory scene. And finally, she examines the debate about Mary’s innocence by firsthand witnesses and her attorneys that continued well into the early 1900s. The pendulum swung from the public believing in her guilt, to outrage over what was thought to be the execution of an innocent woman. In the end, Larson has made it clear that the project did not reaffirm her belief in Mary’s innocence, as she expected it would, but led her to a deep understanding of Mary’s guilt and her knowledge of the plan. Well researched and well written, this book is a must read for anyone who wants to more fully understand a humble, pious woman’s role in the conspiracy to kill the President.